Attention teachers who are looking to have an American history class without a textbook! 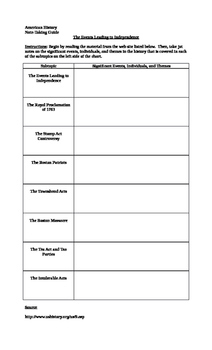 In “Note-Taking Guide for the Events Leading to Independence,” students will investigate the Royal Proclamation of 1763, the Stamp Act Controversy, the Boston Patriots, the Townshend Acts, the Boston Massacre, the Tea Act and Tea Parties, and the Intolerable Acts through an authoritative website, ushistory.org. Students are required to take jot notes on the historically significant events, individuals, and issues that have contributed to the shaping of this period in American history. This study guide naturally includes the web address upon which it has been based. Overall, this note-taking exercise has served as an excellent companion for students at both the grade school and high school levels and has acted as a wonderful tool in the writing of quizzes, tests, essays, reports, and exams.